In this post, we will learn what is Batch Normalization, why it is needed, how it works, and how to implement it using Keras. 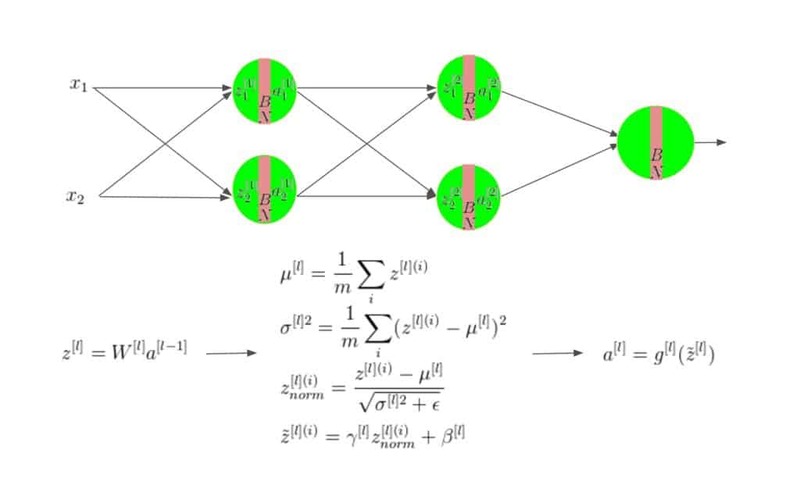 Batch Normalization was first introduced by two researchers at Google, Sergey Ioffe and Christian Szegedy in their paper ‘Batch Normalization: Accelerating Deep Network Training by Reducing Internal Covariate Shift‘ in 2015. The authors showed that batch normalization improved the top result of ImageNet (2014) by a significant margin using only 7% of the training steps. Today, Batch Normalization is used in almost all CNN architectures. In this post, we will first train a standard architecture shared in the Keras library example on the CIFAR10 dataset. We will then add batch normalization to the architecture and show that the accuracy increases significantly (by 10%) in fewer epochs. Before we jump into the nitty-gritty of batch normalization, let us first understand a basic principle in machine learning. Let’s say we have a flowers dataset and we want to build a binary classifier for roses. The output is 1 if the image is that of a rose and the output is 0 otherwise. Consider a subset of the training data that primarily has red rose buds as rose examples and wildflowers as non-rose examples. These are shown in Figure 1. Consider another subset, shown in Figure 2, that has fully blown roses of different colors as rose examples and other non-rose flowers in the picture as non-rose examples. Intuitively, it makes sense that every mini-batch used in the training process should have the same distribution. In other words, a mini-batch should not have only images from one of the two subsets above. It should have images randomly selected from both subsets in each mini-batch. The same intuition is graphically depicted in Figure 3. The last column of Figure 3 shows the two classes (roses and non-roses) in the feature space (shown in two dimensions for ease of visualization). The blue curve shows the decision boundary. We can see the two subsets lie in different regions of the feature space. This difference in distribution is called the covariate shift. When the mini-batches have images uniformly sampled from the entire distribution, there is negligible covariate shift. However, when the mini-batches are sampled from only one of the two subsets shown in Figure 1 and Figure 2, there is a significant covariate shift. This makes the training of the rose vs non-rose classifier very slow. FIgure 3: The top two rows of flowers show a subset of the data and the bottom two rows show a different subset of the data. The two subsets have very different distributions. The last column shows the distribution of the two classes in the feature space using red and green dots. The blue line show the decision boundary between the two classes. An easy way to solve this problem for the input layer is to randomize the data before creating mini-batches. But, how do we solve this for the hidden layers? Just as it made intuitive sense to have a uniform distribution for the input layer, it is advantageous to have the same input distribution for each hidden unit over time while training. But in a neural network, each hidden unit’s input distribution changes every time there is a parameter update in the previous layer. This is called internal covariate shift. This makes training slow and requires a very small learning rate and a good parameter initialization. This problem is solved by normalizing the layer’s inputs over a mini-batch and this process is therefore called Batch Normalization. By now we have an intuitive sense for why Batch Normalization is a good idea. Now, let’s figure out how to do this normalization. Batch normalization is done individually at each unit. Figure 4 shows how it works on a simple network with input features and . Don’t be overwhelmed by the notation! Let’s go over the equations. Figure 4: Batch Normalization on a simple network. In Figure 4, the superscript corresponds to the data in the mini batch, the superscript indicates the layer in the network, and the subscript indicates the dimension in a given layer in the network. In some places, either of the superscripts or the subscript has been dropped to keep the notations simple. The bias could now be ignored because its effect is subsumed with the shift parameter . The four equations shown in Figure 4 do the following. Calculate mean ( ) of the minibatch. Calculate variance ( ) of the minibatch. Calculate by subtracting mean from and subsequently dividing by standard deviation ( ). A small number, epsilon ( ), is added to the denominator to prevent divide by zero. Calculate by multiplying with a scale ( ) and adding a shift ( ) and use in place of as the non-linearity’s (e.g. ReLU’s) input. The two parameters and are learned during the training process with the weight parameters . Note: Batch normalization adds only two extra parameters for each unit. So the representation power of the network is still preserved. If is set to and to , then equals , thus working as an identity function. Thus introducing batch normalization alone would not reduce the accuracy because the optimizer still has the option to select no normalization effect using the identity function and it would be used by the optimizer to only improve the results. If we use a high learning rate in a traditional neural network, then the gradients could explode or vanish. Large learning rates can scale the parameters which could amplify the gradients, thus leading to an explosion. But if we do batch normalization, small changes in parameter to one layer do not get propagated to other layers. This makes it possible to use higher learning rates for the optimizers, which otherwise would not have been possible. It also makes gradient propagation in the network more stable. Since the normalization step sees all the training examples in the mini-batch together, it brings in a regularization effect with it. If batch normalization is performed through the network, then the dropout regularization could be dropped or reduced in strength. In traditional deep neural networks, it is very hard to use saturating activation functions like the sigmoid, where the gradient is close to zero for inputs outside the range (-1,1). The change in parameters in the previous layers can easily throw the activation function’s inputs close to these saturating regions and the gradients could vanish. This problem is worse in deeper networks. On the other hand, if the distribution of the inputs to these nonlinearities remain stable, then it would save the optimizer from getting stuck in the saturated regions and thus training would be faster. 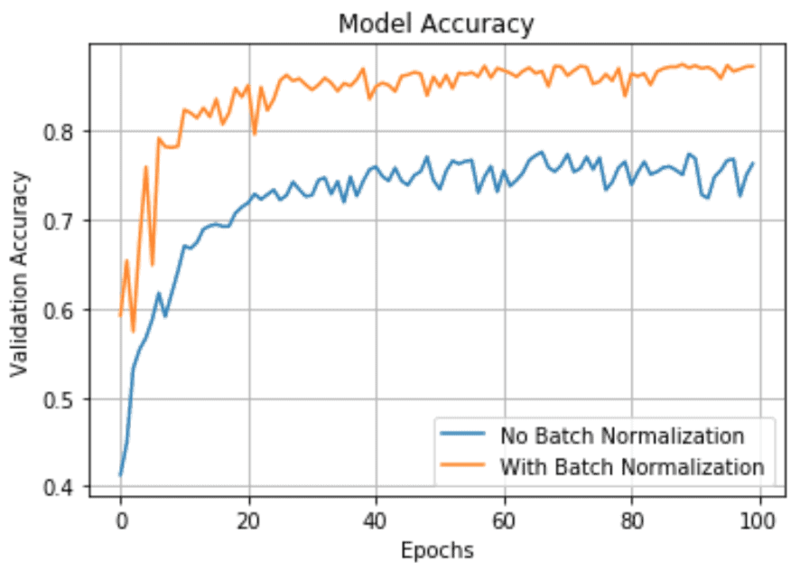 We use the Keras code provided here as a baseline for showing how batch normalizations can improve the accuracy by a large margin. The baseline code does not use batch normalization and the following changes were made to it to add on batch normalization. Batch Normalization calls were added in keras after the Conv2D or Dense function calls, but before the following Activation function calls. Here are some examples. Dropout calls were removed. Batch Normalization itself has some regularization effect. So usually dropout can be reduced. In our case removing it altogether also did not reduce accuracy. Learning rate of the optimizer was increased 10 times from 0.0001 to 0.001. Rmsprop optimizer was used as in the baseline code, but this would be true for other optimizers too. We used the same numpy seed to both the baseline and batch normalization versions in order to make a fair comparison between the two output versions. Since most of the deep learning algorithms are stochastic, their outputs are not exactly same in different runs, but the batch normalization version outperformed the baseline version by large margins in all the runs, with the same numpy seed as well as without giving the same numpy seed. Both the versions have roughly the same run time needed for each epoch (24-25 s), but as we see in the above plot, the accuracy attains a much higher value much faster if we use the batch normalization. The keras team reports an accuracy of 79% after 50 epochs, as seen in their Github code. Our run of the same code gave a maximum accuracy of 77%, which seems fair, given it is in the same range as theirs and the stochastic nature of the keras runs. But with batch normalization, it increases to 87%. All these runs were done on a GeForce GTX 1080. Above is the plot of the validation vs training losses for both the versions. 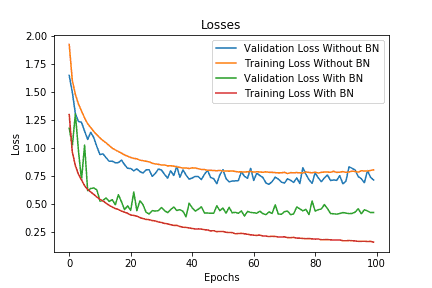 As we can see the validation loss reduces substantially with batch normalization. Image Credits : Some of the flower images used in this post were originally provided by Amanda, Jonathan & Hannes Grobe under the CC BY-SA 2.5 license, from Wikimedia Commons. Thanks, It’s best tutorial of BN! !